After almost 20 years of bringing the Cambodian people independent, reliable and trustworthy news and information from inside the country, Radio Free Asia has regrettably been forced to close its Phnom Penh bureau. The government’s relentless crackdown on independent voices in recent weeks has made it impossible to keep the bureau open while guaranteeing the integrity of RFA’s journalistic mission. It has become increasingly apparent that Prime Minister Hun Sun has no intention of allowing free media to continue operating inside the country ahead of the 2018 elections. The government has instead seized on every opportunity to go after critics, political opponents, NGOs, and independent media committed to reporting the truth. Using a thin pretext of tax and administrative violations, authorities have closed independent radio stations carrying RFA, Voice of America, and Voice of Democracy. The government has forced The Cambodia Daily newspaper to close due to an extreme and punitive retroactive tax bill and has kept its manager, Mr. Steele, from leaving the country under threat of criminal charges. Authorities have been employing these same tactics against RFA, despite our full cooperation at every step to comply with all requests and our sincere efforts to register as a licensed media company. Nevertheless, they have resorted to false statements and increasingly threatening and intimidating rhetoric about RFA, made mostly through leaked documents on government mouthpiece media and random statements from different ministries. Facing down intimidation is nothing new for RFA. Our journalists and commentators have been threatened, jailed, and forced to leave the country to avoid arrest or worse. But recent developments have intensified to an unprecedented level, as Cambodia’s ruling party shamelessly seeks to remove any obstacle or influence standing in its way of achieving absolute power. Through the years, Cambodian journalists working for RFA have risked their lives to report on corruption, illegal logging, forced evictions, bribery, labor disputes, and rights abuses, among other important stories largely ignored by state-controlled media. Their hard work has helped to build the foundation of RFA’s investigative, in-depth journalism from the ground up and has earned us the trust of the Cambodian people — to whom we also owe our heartfelt gratitude. The sacrifice and support of staff and audience alike reinforces the need for RFA to keep Cambodia’s citizens informed, so they possess a more complete and accurate picture of what’s happening in their neighborhoods, their towns, and their villages. We hope that the government will not persecute the individual brave Cambodians who worked with us in retaliation for RFA’s efforts to bring reliable free press to their countrymen and women. RFA stands resolved to stay true to its vital mission in Cambodia, now more than ever, to go forward shining a light even in the darkest of hours. RFA will keep reporting on the most important and censored issues and events inside the country — and we will continue to broadcast and publish our programs, reports and content on shortwave radio, social media, and on our website. As history has shown, dictators may rise and force their will on nations, but the people will always seek truth in pursuit of freedom. This entry was posted in Broadcasters, News, Shortwave Radio and tagged Cambodia, Free Speech, Radio Free Asia, RFA, shortwave, Why Shortwave, Why Shortwave Radio on September 15, 2017 by Thomas. Internet and mobile phone users in South Sudan are not able to access the websites of at least four independent media outlets. The government has grown increasingly hostile to the media since civil war began in 2013. 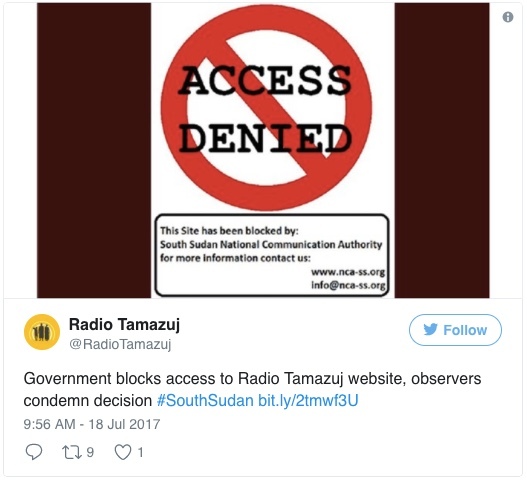 The South Sudanese government has blocked access to the websites of Dutch-backed Radio Tamazuj, as well as the popular news blogs Nyamilepedia and Paanluel Wel. Internet users said that the website of the Paris-based Sudan Tribune was also affected on some mobile phone and Wi-Fi networks. Radio Tamazuj and the Sudan Tribune are reputable sites which have been critical in their coverage of South Sudan’s government, which has grown increasingly hostile towards the media since civil war broke out in 2013. Continue reading at Deutsche Welle online. Fortunately, the South Sudan communities I’ve worked with through Ears To Our World have access to shortwave radio which is not affected by an Internet block. No doubt, shortwave radio is the ultimate free speech medium, as it has no regard for national borders, nor for whom is in power (or not in power) at any moment. Shortwave radio may be a sunsetting technology, but it’s also the most accessible and effective vehicle of the free press. What other technology can thoroughly blanket the globe with news and information yet can also be be received with a simple $20 battery-powered portable device? 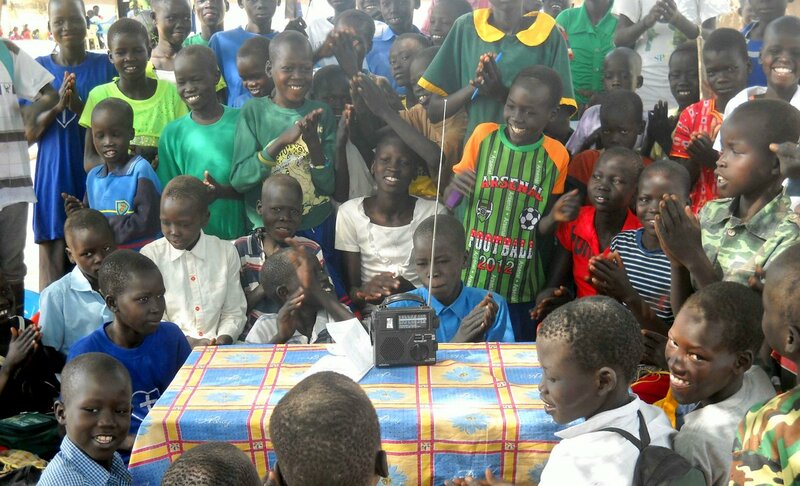 This photo was taken in South Sudan, after Ears To Our World distributed radios in this rural community for the fourth year running. We’ve been distributing radios in South Sudan through our partners there since 2009. Check out these recent comments from the head of DW regarding the importance of international broadcasting. Thanks for the tip, Rich! This entry was posted in International Broadcasting, News, Shortwave Radio and tagged Deutsche Welle, Free Press, Free Speech, Internet Censorship, Shortwave Radio, South Sudan, Why Shortwave, Why Shortwave Radio on July 23, 2017 by Thomas. […]The station broadcasts a two-hour programme in Arabic and Tigrinya seven days a week, repeating it several times a day, giving listeners inside Eritrea multiple opportunities to listen (they may do so, in the privacy of their own homes with the shutters closed and the sound turned down, only when electricity is available – which it often isn’t). As well as news about what the regime may be up to, it provides a detailed picture of what is happening to the refugees who are travelling to Europe – when a boat carrying 360 Eritreans capsized off Lampedusa in 2013, a correspondent was immediately dispatched to Italy – as well as features about diaspora success stories, footballers and athletes among them. Readers: this is only an excerpt from this excellent article in The Guardian. Click here to read the full article. This entry was posted in Broadcasters, Clandestine, International Broadcasting, News, Shortwave Radio and tagged Biniam Simon, Clandestine, Clandestine Radio, Eritrea, Radio Erena, The Guardian, Why Shortwave, Why Shortwave Radio on July 16, 2017 by Thomas.